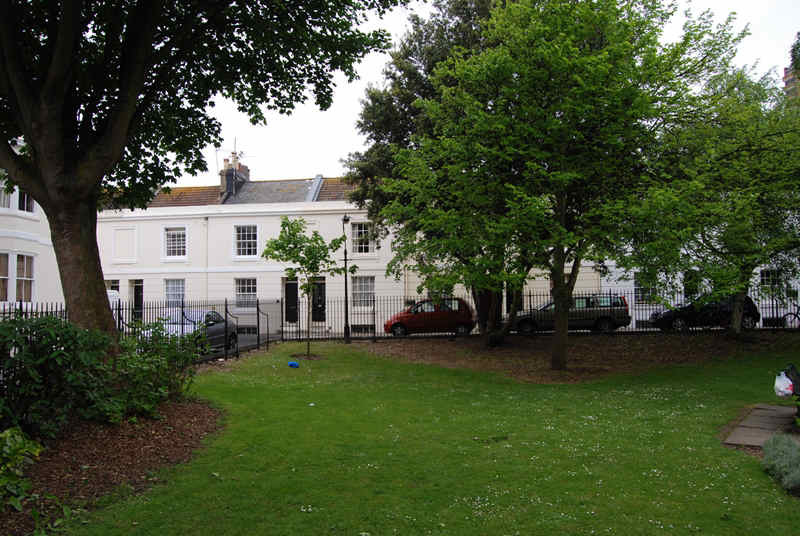 Pelham Square is a small enclave of Regency houses surrounding a landscaped garden. 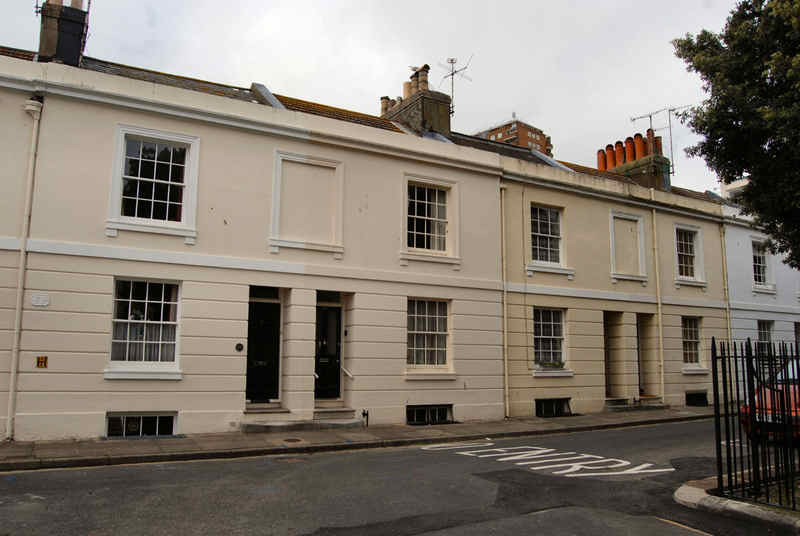 The three-storey houses on the western side and the two houses on the outer-most southern sides were erected in the early 1840s, possibly 1842, on the old North Hall estate, and were originally designed as a terrace called Pelham Terrace. 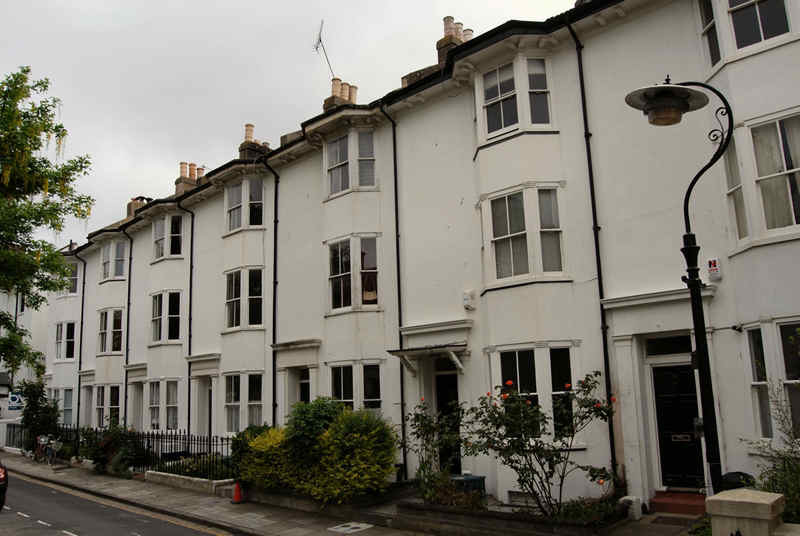 The three-storey houses on the eastern side with small front gardens were erected c.1866. 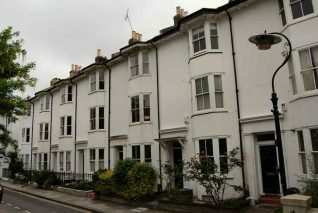 In 1867 the five two-storey houses on the inner-most southern side were added, blocking off Pelham Terrace, and thus creating Pelham Square in the shape we have today. Houses numbered 1-12 and 15-24 are all listed buildings, numbers 12 and 13 being the outer-most southern houses which are not listed. The house numbers have constantly changed, allowing for the changing shape of the square. There is an old garage located at the southern end of the square, located in house number 12’s garden. This housed a second-hand furniture dealer, owned by Mr Geary, which was then taken over by the Aubrey Press. The garage is now not in use. Pelham Square takes its name from local aristocracy: Thomas Pelham, who was the first Earl of Chichester and lived on the family estate located at nearby Stanmer Park from 1728. The estate was passed down through the family, whose blood-line descendents are still alive today. 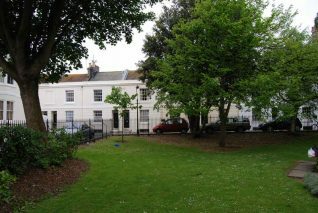 The Pelham family were influential in government, and have donated many trees to public parks located around Brighton. 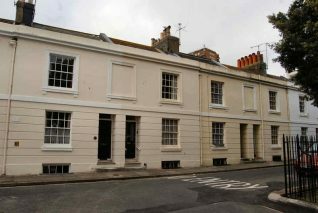 The square was developed by two local businessmen, Mr Hack and Mr Lynn, in the 1860s. They owned the land on which the square is built. Mr Hack, who was an alderman, or member of local parliament, lived opposite the square on Trafalgar Street. The square was also owned and used by the York Place Elementary and Secondary schools, renamed the Fawcett School for Boys and the Margaret Hardy School for Girls. The schools placed their own fence around the garden, which was not used by the residents of Pelham Square but which was used as a football pitch and recreational area, and which also had its own air-raid shelter for the school. During the First World War, the school buildings housed an Indian Military Hospital, an extension of the one located at the Brighton Pavilion. It is possible that Pelham Square was used as a recreational area for those staying at the hospital. The land is now owned by the council and Pelham Square is an open public space. The Square was used by the residents to hold the Coronation street party in 1953. It has also been used by the North Laine community association. Local people have many positive memories of the square; some have called it a ‘sedate aunty’ amongst all the hustle and bustle of Brighton, others remember their child’s first footsteps taking place in the square. A resident’s ashes have also been spread in the garden. The garden was landscaped in 1980, to celebrate the Queen Mother’s 80th birthday, and was renamed the Queen Mother’s Garden, although it is still known as Pelham Square. Benches, trees and telephone boxes! There are four benches inside Pelham Square, all of which have been dedicated to the memory of someone. There are thirteen trees in Pelham Square, seven of which appear to be the original trees planted around the perimeter when the garden was first developed in the 1860s. The five other trees are much younger, possibly planted in 1980 to coincide with the landscaping of the flower beds and paved areas. 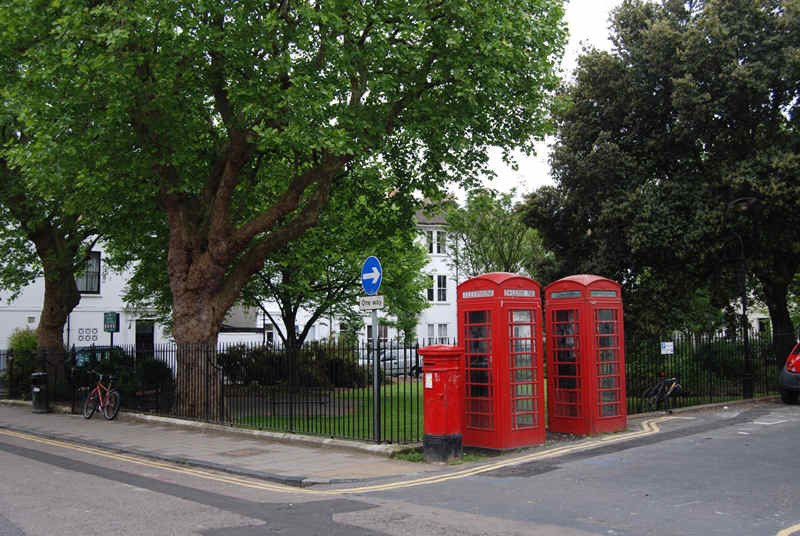 There are also two K6-type telephone boxes located on the upper western side and outside the perimeter of the square, which have been designated as buildings of special architectural interest as British Telecom replaces this style of kiosk. I’d just like to say a big thank-you to everyone who responded to my request for information on Pelham Square, and apologise for those people I was unable to contact due to time restrictions. If anyone has any more memories, corrections or comments, please post below! I have used information from many sources, including this website, and Tim Carder’s The Encyclopaedia of Brighton, 1999 edition. Thanks again, Siobhan Osgood. I lived here for a short time with a school friend called Vanessa Trangmar. I think it was number five. We used to play in the square. I spent the Christmas of 1958 there. We were always sent to Sunday school at St.Peter’s whether we wanted to go or not. Her house was on the left as you look from Trafalgar St.
I’m not sure this square can be described as Regency when its construction didn’t begin until after the Regency had ended; if its construction commenced in the 1840s then we are in Victoria’s reign and although the western houses look Regency in style the rest of the square is distinctly mid-19th century in character. I agree with Stuart Johnson’s comment. The houses in this Square are definitely not Regency as they were built in the 1840s and 50s – after the Regency period, which ended in 1820. At the time of writing there are now only three benches in the Square as one of them collapsed and had to be removed in 2014. Several of the newer trees were planted by friends and neighbours in memory of people who once lived in the Square (nothing to do with the redesign of the Square). An example is Irene Parry, who lived at No 3 and died in 2005. She had done wonderful work right up to the time of her death (aged 83) for those less fortunate in our society and in particular she did a lot to improve services for the homeless in Brighton. She was commemorated with a tree planted next to the side gate very near to her house. Another tree, planted in the south-west corner of the Square, was in memory of Ted Warburton, who had lived at No 14 and died in 2006. He had worked in many capacities (Chair, Environment Co-ordinator etc) for the North Laine Community Association ever since he first moved to the North Laine area and was a king-pin, with his wife Joan, of community life in the area over many years. And so on….Today it is considered that the Square probably has too many trees for such a small space. When the newer trees were planted one by one, nobody took into account that these tiny saplings would grow and grow. At certain times of day there is now very little space for sitting in the sun, as people like to do. The two old-style telephone boxes are no longer in use but are much photographed by visitors to the area! I wonder if anyone can help me. There are 2 busts on our garden wall (No. 7), one looks like Shakespeare and the other looks like a dignitary of the 1800s. Has anyone lived in No. 7 and put these 2 busts on the wall? I would dearly love to know who they are! Can anyone help?